Read the table of contents to Too Much Medicine, Not Enough Health. Read the first chapter: The Other Health Care Crisis. 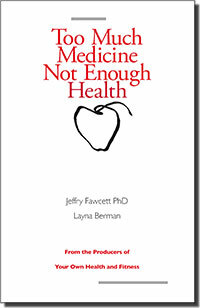 This collection of over 60 penetrating essays by health educators and broadcast journalists Jeffry Fawcett and Layna Berman unpack the shortcomings of the science that leads to overdiagnosis and overtreatment at the hands of the health care system. Fawcett and Berman offer an alternative to health as the absence of disease: health as the biological capacity to lead a full, rich life. The essays consist of 48 articles previously published in the Progressive Health Observer organized into 15 sections. Each section is introduced by an original essay.